There Is Good News! Healthcare professionals have more control than they may imagine over the quality of both the patient experience and their own level of satisfaction in the workplace. IS YOUR MEDICAL PRACTICE A GREAT PRACTICE? Great medical practices look and sound different than their competition. Profitability contributes to greatness, as does superior medical expertise. Although these are important, GREATNESS is more than profitability and medical expertise. Equally important to being GREAT is the ability to deliver an exceptional patient experience 99% of the time. 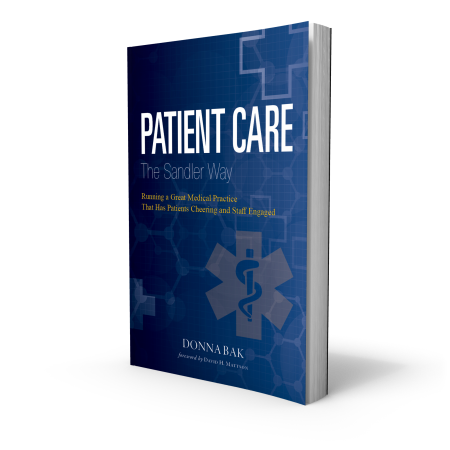 To find out, get a FREE sample chapter from Donna Bak's breakthrough book, Patient Care The Sandler Way. Sandler trained medical practices place a high priority on creating an excellent customer experience. Master the "inner game" that creates and sustains a respectful, productive, low-stress environment for both patients and staff. Learn how to approach their job with positive attitudes and productive behaviors that transform the way they think about themselves, their peers, and their patients. Learn how to develop proven skills to deliver an exceptional experience that leaves patients and peers smiling. Receive long-term and incremental reinforcement training and coaching to ensure a significant, lasting return on the training investment. Inevitably a question arises for every medical practice: "Are we good - or are we great?" Sandler's approach has been successfully implemented by medical practices in a variety of disciplines. Each of these practices has taken team performance to the next level. Sandler and author, Donna Bak provide long-term and incremental reinforcement training and coaching to ensure a significant, lasting return on the training investment. "Donna's book helped me realize that we had more control than we imagined when it came to managing interactions with difficult people." "Every medical practice in the U.S - public or private - needs to read this book. You'll walk away with countless best practices to help you move from being a pretty good practice to being a great practice." "A must read for any healthcare enterprise that truly cares about sustainable growth."